Agartala Municipal Council (amc) has issued trade licences to 768 small- and medium-scale jewellery units in densely populated residential and commercial areas of the capital city. It is also in Shantipara and surrounding areas of the city where the business is concentrated that 37 jewellery workers and 11 residents are suffering from cancer, according to the Agartala Cancer Hospital. Over a hundred people in Shantipara are suffering from skin and breathing problems. No one has studied the link between jewellery units and the incidence of cancer and other ailments but it is undeniable that these unorganized and ill-equipped units are a threat to people's health.Shubankar Deb, a resident of Kansharipatty, which is full of jewellery-manufacturing units, points out that these units are built on drains along the road in a makeshift arrangement and the liquid and solid waste is discharged in the sewer line, which touches some water supply points. "We have to endure an obnoxious smell emanating from jewellery houses but can do nothing because they are licensed and the government does not inspect them. We raised the issue with the amc commissioner but did not get any satisfactory response," he adds. Breathlessness, skin infection, ulcer and gastroenteritis among middle-aged people and ophthalmologic complications and acne among children and the youth are common, says Pradip Bhowmik, professor, Agartala Government Medical College. He attributes these ailments to air and water pollution, adding that unorganized and unchecked growth of the jewellery business has a definite contribution to it. "However, it's difficult to make any conclusive comment since there has been no study on workers and the business," he says. Most big jewellery houses are melting and mixing crude metals in small shops. Shops in Agartala consume about 1,700 litres of highly concentrated nitric acid in a month. Some manufacturers are also using highly toxic cadmium, which helps gold jewellery retain its purity even when melted in a crude manner. According to Arjun Kumar De, a postdoctoral scholar of inorganic chemistry in Tripura (Central) University and executive of the leading private research body arpan, a blend of nitric and hydrochloric acid called aqua regia is used in metal cleaning, etching and oxidizing. Its fume in moist air reacts readily with organic compounds and many metals. In some cases, this can produce fire or explosion. In reaction with gold aqua regia produces poisonous nitrosyl chloride, nascent chlorine and nitric oxide. Acidic vapour is irritating to the eyes, throat, lungs and corrosive to the teeth. If inhaled it can cause severe coughing, chest pain and breathlessness, and finally cancer, says Biprojit Debbarma, one of Tripura's leading physicians. "I have been working in the jewellery manufacturing sector for 28 years and have developed breathing problem and chronic cough," says Sanjoy Banik, an artisan in Agartala. "I have heard of health hazards but I have to work." Biswajit Paul, another artisan, adds, "Most artisans are not aware of the hazards but we still take precautions like making the cadmium solder in open space." The jewellery business started in Shantipara some 40 years ago with three shops and today there are more than a thousand of them in Agartala, says Satish Chandra Saha, 89-year-old resident of Shantipara. "Investment in gold is safe and free from the complications of going to banks or other financial institutions. 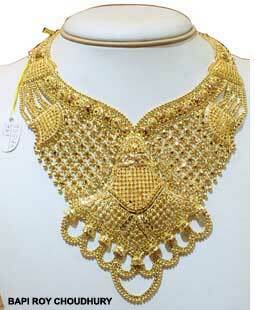 That is why our people are interested in buying jewellery," adds Saha. The business is booming across Tripura (see box Tinsel town). All the 18 towns of Tripura have registered more than 1,500 jewellery shops where about 10,000 workers are employed without proper training, says state labour commissioner M K Nath. "Though the shop owners are rich, the workers are not paid well. Since there are not enough jobs for unskilled labourers, people have opted for the profession," he admits. 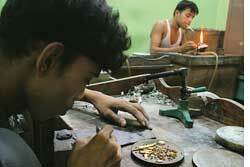 Ravi, a young boy, stays on the premises of a jewellery manufacturing unit in Agartala. His food and lodging are taken care of by the employer. He will not be paid for the first three years, but he is learning skills and tomorrow he will be skilled enough to be employed by big houses in the business. If an artisan has an expert hand and an eye as a setter, he can earn up to Rs 8,000 a month. Otherwise, the salaries range between Rs 1,000 and Rs 4,000 a month, says Sukhamoy Saha, owner of a gold-melting unit in Agartala. But their working conditions are poor and most suffer from nausea, wheezing and anorexia. There has also been an alarming rise in cancer cases in the state. "Although no one can say for sure whether jewellery manufacturing contributed to this, our observation found that lung, blood, skin and throat cancer are common in Tripura," says Arup Roy Barman, Tripura's leading oncologist. According to Goutam Majumdar, Superintendent of Tripura Cancer Hospital, the number of cancer patients has increased by about 30 per cent in the past decade in Tripura. But he says the major contributor is air pollution and tobacco consumption, and only about 4 per cent of the patients are working with hazardous units. Two administrative authorities who are supposed to take care of the environment and citizen's safety--Tripura Sate Pollution Control Board (tspcb)--and amc are either not aware of the hazard or are unconcerned. tspcb chairman Mihir Deb admitted the ill-effects of the business and his inaction over it. "Since jewellery manufacturers still belong to the unorganized sector and have been doing business in both residential and commercial areas, we could not do much despite knowing the impacts," says Deb. He underlines that these shops need to be declared hazardous business units and shifted to well-managed locations, which is the sole responsibility of the municipal authority. Reacting to the tspcb statement, Chief Executive Officer of amc, R C Podder, said, "We have issued trade licences to small business units in our jurisdiction but nobody raised the issue of pollution. If tspcb found something wrong why did it not take up the matter with amc or the state government?" Assistant Environmental Engineer of tspcb Sumanta Chakraborty, however, maintains, "It is a fact that jewellery units are discharging untreated chemicals and effluents into municipal drains and water bodies. Increased nitrogen content in water bodies upsets the chemical balance of the nutrients used by aquatic organisms." State science and environment minister Joy Gobinda Debroy asserts the government will soon find out measures to contain the hazard. Chakraborty adds a word of caution. Since thousands of families are dependent on the business, the issue needs to be addressed at the highest policy making forum. He also points out that in Agartala there is no designated industrial or commercial zone. "Hallmarking by the Bureau of Indian Standards ensures that the consumer gets pure gold as stated by the manufacturer. There should be similar checks to ethical practices, such as working conditions of artisans," says Rupak Saha, owner of a big jewellery house with presence in four towns. There are unanswered questions staring authorities in the face. How are jewellery manufacturers procuring dangerous nitric acid from the open market? Why did not tspcb inspect the manufacturing units? Why is amc not keeping track of business practices after issuing trade licences? Colleges procure nitric acid and other chemicals from authorized traders but jewellery-manufacturing units in Tripura are getting cadmium and nitric acid from chemicals shops by just showing the trade licence. "The executives of tspcb are not competent enough to understand the exigency of the issue," says social activist and former mla Tapas Dey. He alleges that tspcb has shifted from its mandate and has not done any scientific work in the past five years. Rather it is interested in getting cheap publicity through rallies, seminars, lectures and advertisements.